NREC is developing an Off-road Crew Augmentation System that would allow crewmembers to operate the next generation of military ground vehicles to their maximum capabilities. Currently human drivers are limited in their ability to operate vehicles in difficult off-road terrain for long distances, especially in darkness and adverse weather. For any vehicle, driving at higher speeds implies taking higher levels of risk. Furthermore, when operating at maximum speeds, the vehicle can be forever on the brink of catastrophe, nearly spinning out on turns, rolling over on slopes, and bottoming out on jumps. Achieving minimum time between waypoints also requires the driver to always make correct navigational decisions, including choosing the fastest routes and avoiding cul-de-sacs and other delays in unanticipated environments where road networks are unknown. 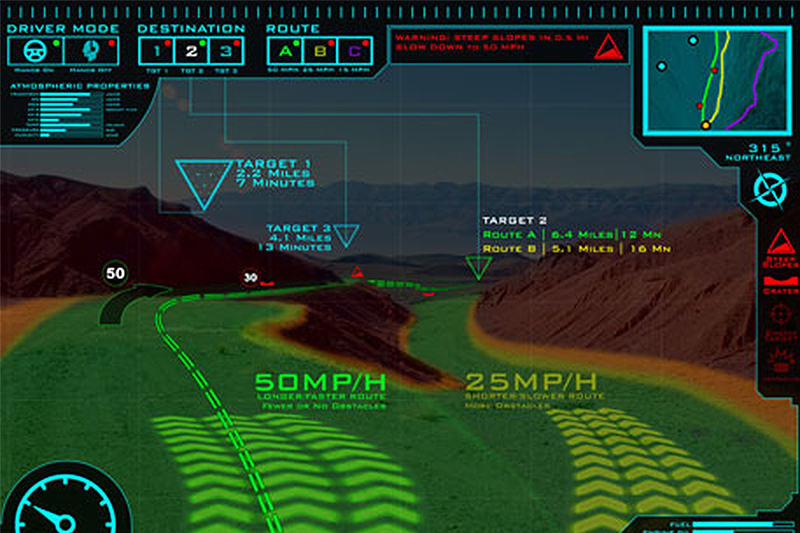 The Off-road Crew Augmentation System is intended to maximize the ability of ground vehicle operators to approach the vehicle’s physical mobility limits for a given terrain. The technology would incorporate a suite of autonomy capabilities configured for semi-autonomous use and would allow for the crew to transition to full autonomous driving in order to attend to other duties while a “virtual driver” would take over seamlessly and control the vehicle in “hands-off” mode. The goal of this technology is to enable crewmembers to make fewer mistakes, stay on course, and reduce wear and tear on the vehicle.